Flip phones have gone out of vogue in favor of the sleeker, flatter smartphone, but designer Kristian Ulrich Larsen has a new take on the whole concept of a phone that flips. The Flip Phone is a revolution in the arena of mobile phone design. Instead of the ubiquitous flat rectangle that seems to represent every smartphone these days, the Flip Phone features three separate screens. The screens can be arranged and used in a variety of different ways, even running different apps on all three at the same time. They can be opened up to create a large display or folded into a triangle to make a traditional-looking clock. 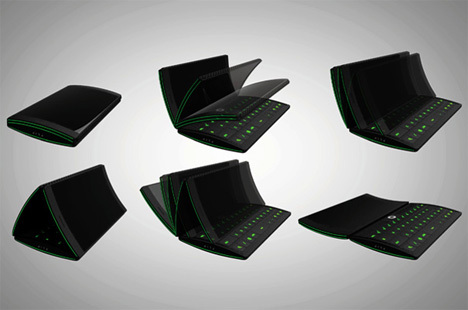 They can become a screen and a keypad or a book-like e-reader – and there are seemingly endless other configurations. 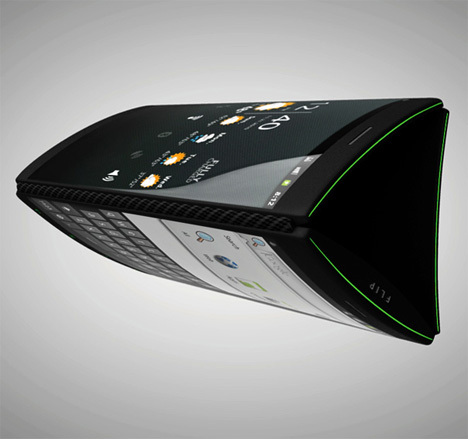 The phone was the product of a six-week creative workshop involving Larsen and other designers. Larsen then further developed the idea as part of his MA program. He saw that people are using their mobile phones for far more than just communicating verbally or via text; they’re using them much in the way that we use our laptop computers. This led him to design a phone that would work more like a computer and allow users to do more – or less, depending on just what they need at the moment. 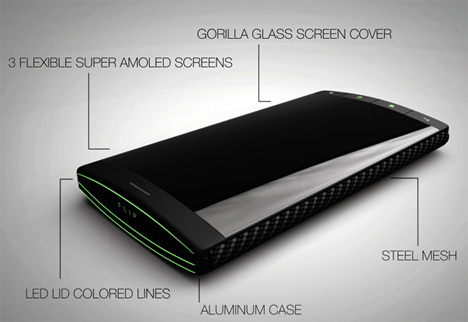 The phone would consist of three flexible AMOLED screens covered in Gorilla Glass, a lightweight aluminum case and steel mesh at the joints to make the phone easy to bend and flip around. 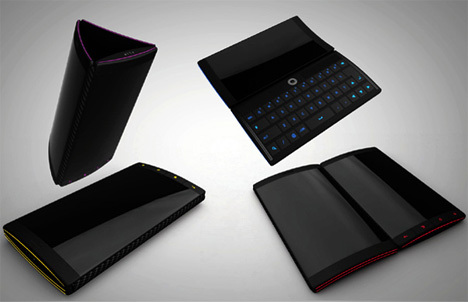 It’s safe to say that the highly unusual design is unlike any mobile phone on the market today. Whether it is ever developed into a real product remains to be seen, but judging from the demo video it’s going to take a lot of fancy software to make this phone capable of everything Larsen wants it to do.